Were you diagnosed with non-Hodgkin lymphoma or another blood cancer after being exposed to the weed-killer Roundup? The International Agency for Research on Cancer and several studies have linked the widely used herbicide Roundup to certain blood cancers. If you or someone you love was harmed as a result of exposure to the herbicide Roundup, you may be entitled to financial compensation. There may be substantial cash awards and payouts from claims and settlements from a Roundup class action lawsuit. Call the lawyers at National Injury Help today to see if you qualify for a Roundup Lawsuit. 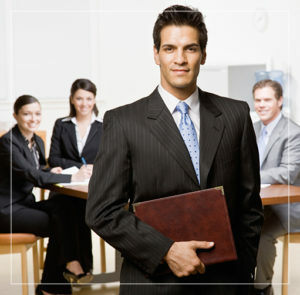 Call 1-800-214-1010 for a free case evaluation or use the form on the right-hand side of your screen. BREAKING NEWS -March 28, 2019. A San Francisco jury says Monsanto (now owned by BayerAG) was liable for Mr. Edwin Hardeman’s non-curable cancer called non-Hodgkin lymphoma. This verdict was awarded March 27, 2019 after al six jurors decided in favor of the clamant Edwin Hardeman, stating after the trial: “As demonstrated throughout trial, since Roundup’s inception over 40 years ago, Monsanto refuses to act responsibly.” Click here to read the verdict on our blog. Monsanto Must pay California man $289 million in Roundup Cancer case. 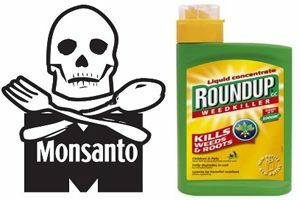 August 12, 2018 –A San Francisco jury ordered chemical giant Monsanto to pay $289 million Friday to a school groundskeeper who got terminal cancer after using Roundup, a popular weed killer. The San Francisco Superior Court jury deliberated for only two and a half days before finding that Dewayne Johnson’s non-Hodgkin lymphoma was at least partly due to using glyphosate, the primary ingredient in Roundup. Johnson regularly used glyphosate to spray fields while working as a groundskeeper. Monsanto said it will appeal the verdict. July 12, 2018 – San Diego, CA. U.S. District Judge Vince Chhabria made it clear that Monsanto’s Roundup weed killer product lawsuit should be allowed to proceed. There are close to 5,000 lawsuits currently filed against Monsanto claiming its product called Roundup causes Non-Hodgkin’s lymphoma, a type of blood cancer from exposure to this chemical spray. This court verdict is a step forward for these claimants. These lawsuits were filed throughout the U.S. and were consolidated before Judge Chhabria in In re: Roundup Products Liability Litigation (MDL No. 2741). To click here read about the current Roundup Litigation News and Court hearings. On March 28, 2017, the Office of Environmental Health Hazard Assessment (OEHHA) posted a Notice on its website that glyphosate (CAS No. 1071-83-6) would be added to the list of chemicals known to the state to cause cancer for purposes of Proposition 65 with a delayed effective date due to the pending case Monsanto v OEHHA. Monsanto’s challenge was unsuccessful in the trial court. Although the case has been appealed, no stay of the listing has been granted. Therefore, glyphosate is being added to the Proposition 65 list on July 7, 2017. Non-Hodgkin lymphoma is a serious and potentially deadly side effect of exposure to the weed killer Roundup. NHL is a form of cancer that begins in the body’s lymphatic system, a part of the circulatory system and an integral part of the immune system. In NHL, tumors form from lymphocytes – a type of white blood cell – and can spread to other parts of the body. NHL can begin in the body’s B cells, which help fight infections by producing antibodies, or the T cells, which kill foreign invaders directly. The most common subtypes of NHL, diffuse large B-cell lymphoma and follicular lymphoma, involve the B cells. Determining where the NHL originated can help determine treatment options. Survival rates of NHL can depend on the type and stage of the cancer and the treatment options available. More than 72,000 new cases of NHL are expected to be diagnosed in the United States in 2016, and about 20,000 people are expected to die from NHL the same year. Symptoms of NHL often mimic those of other diseases, so it is important to speak with your doctor about any persistent signs or symptoms that worry you. Roundup is prolific in the environment. It has been sprayed on millions of acres of farmland since Roundup Ready seeds were introduced in the late 1990s and has been used by millions of Americans at home since the 1970s. When pesticides like Roundup are applied to fields or yards, their residues can wind up in our drinking water and our food. That means virtually everyone is at risk for exposure, though some may be more at risk than others. How are people exposed to Roundup? Exposure to Roundup and its active ingredient glyphosate can occur in several different ways, including inhalation, direct contact with skin, and ingestion. 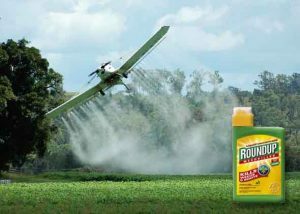 When Roundup is sprayed onto a field or the home garden, those applying it are at risk of breathing in some of the product. But those spraying the product may not be the only ones at risk of inhaling it. Nearly two-thirds to 100% of air samples taken in Mississippi and Iowa during the 2007 and 2008 growing seasons tested positive for glyphosate, according to a U.S. Geological Survey. This means people and communities in the vicinity of farms using Roundup could be exposed to the carcinogen. Roundup can be absorbed through the skin, so any direct contact of the product with the skin could result in exposure. For example, as Roundup is sprayed onto a field, workers in the vicinity may come in contact with the product even if they are not the ones spraying it. People handling soil contaminated with the weed-killer can also be exposed through direct skin contact. Even people living in communities in close proximity to farms using Roundup may be exposed to glyphosate. The same U.S. Geological Survey that tested air samples in Mississippi and Iowa also tested rain samples and found nearly two-thirds to 100% tested positive for the herbicide. People may be exposed to Roundup through the water they drink and the food they eat. The same U.S. Geological Survey found glyphosate residue in streams and surface water, and glyphosate residue has been found in honey, soy sauce, infant formula, and even breast milk, according to an article from Reuters. There is a reason Monsanto chose to produce Roundup-resistant soybean and corn seeds: soybean and corn products are in the vast majority of processed foods available in America. From salad dressing to cereal, coffee creamer to cookies, soybean or corn products are sure to be an ingredient listed on the nutrition label. Even crops that aren’t Roundup Ready are being sprayed with Monsanto’s herbicide in the late stages of growth. Beginning in 2006, farmers began dousing wheat and barley fields shortly before they were harvested to kill weeds and speed up the drying out process. This practice may put consumers at an even greater risk for ingesting glyphosate residues in foods. Who is at risk of Roundup exposure? You don’t have to work on a farm to be exposed to Roundup. Glyphosate residues are found in the air and drinking water near agricultural fields where they are applied, putting whole communities at risk. Roundup is a popular herbicide to use at home, as well. Americans have used the product since it was introduced in the mid-1970s to control weeds and other pests in their gardens and on their lawns. Glyphosate residue has also been found in food products, giving rise to the concern that virtually every American could be exposed to the probable carcinogen at some point in his or her lifetime. Monsanto lost its exclusive patent rights for Roundup’s main ingredient glyphosate at the turn of the new millennium. This opened the door for new products to be manufactured with the weed-killing ingredient. Other products containing glyphosate include Rodeo, AquaNeat and AquaStar. Since IARC made the determination that Roundup is probably cancer-causing to humans lawsuits have been filed against Monsanto on behalf of individuals who were diagnosed with non-Hodgkin lymphoma or any of its subtypes. In September and October of 2015, lawsuits were filed in California and Delaware state courts against Monsanto. These lawsuits allege clients suffered exposure to Roundup in crop fields, commercial nurseries and at home, and that prior to IARC’s evaluation, they did not know or could not have known about the cancer-causing danger of glyphosate and Roundup. If you or someone you love was exposed to Roundup and were diagnosed with non-Hodgkin lymphoma or another blood cancer, you may be entitled to cash compensation. The lawyers and attorneys at National Injury Help are ready to answer your questions and help you determine if your case qualifies for a Roundup Lawsuit. Three recent questions about the Roundup lawsuit. How much can you get for a Roundup lawsuit? How much compensation would I get from the Roundup class action lawsuit? How much is the settlement in the Roundup lawsuit? The answer to these questions can be difficult to predict, as the class action for this hasn’t started yet. There is still time for join in this Roundup lawsuit, but there are statutes of limitations that apply. Some of the past defective product lawsuits have had millions of dollars in a compensation fund, and then that is divided up between all who have joined the lawsuit. Example: $100,000,000 in a settlement fund that would serve 1,000 victims would be $100,000 per person. This is only an example and does not represent what may happen for Roundup victims. Call the lawyers at National Injury Help today at 1-800-214-1010 for a free case evaluation or use the form on the right-hand side of your screen. Monsanto Roundup Cancer Lawsuit Claims & Settlements Non-Hodgkin Lymphoma page updated on March 28, 2019 for litigation and court news.